Gravenhurst is the birthplace of a famous Medical Hall of Famer Dr. Norman Bethune who was born on March 4, 1890. Dr. Bethune obtained his Medical Degree in 1916 from the University of Toronto. During his lifetime Dr. Bethune was always questioning the medical norm researching ways to improve medicine and medical care further. His motivation for being a doctor came from his Great Grandfather Dr. Norman Bethune, who also got his Medical Degree in Toronto in 1848. 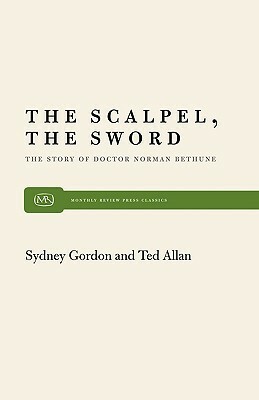 In the 1920s he became ill with tuberculosis, which at the time was a death sentence, or at the least meant years staying in a hospital He wanted the doctors to try a radical procedure to help him. He had a pneumothorax medically induced which collapsed his ailing lung and allowed the lung to rest and heal. Dr. Bethune went on to recover fully and continued practicing medicine. In 1928, Dr. Bethune joined the thoracic surgeon pioneer Dr. Edward William Archibald. From 1928 to 1936, he perfected and modified over a dozen new surgical tools. One of these is still widely used today: the Bethune Rib Shear. To hone his surgical skills, Dr. Norman Bethune went to help out in Spain during the Spanish Civil War. While there he developed a mobile blood transfusion clinic, which allowed him to save lives right on the frontline. People were able to witness wounded soldiers waking up from near death. The mobile unit was known as El Servicio Canadiense de Transfusion de Sangre. It covered a wide area of Spain. He returned on June 6, 1937, to Canada to raise awareness and help for the Spanish Civil War. Never able to stand still, in January 1938 he went to China, to organize medical services for the frontline soldiers during the second Sino-Japanese War. Here he was instrumental in bringing modern medicine to rural China. Rural Medicine, as we now practice in Gravenhurst, Ontario. In China, he would treat the soldiers and villagers equally. His name and good works begin to spread through the Chinese countryside. He was a supporter of equal access to medicine, years before Canada adopted its social medicine program. Dr. Norman Bethune was quoted saying "Let's say to the people not 'How much have you got? ', but "How best can we serve you?" During his stay in China, he was cut during surgery and developed a finger infection, that would later turn into septicemia claiming his life on Nov 12, 1939. He was working so hard, essentially 'to the bone,' that in his weakened state he was unable to fight this infection. He did such good work while in China, including the teaching of Doctors, Nurses, and Orderlies, that the political leader of China at the time, wrote a eulogy outlining his final years in China. This piece of writing became required reading in the elementary schools of China, and thus millions of Chinese citizens know about Dr. Norman Bethune. Numerous statues of Dr. Bethune were raised throughout China, and Medical Schools were named after him. The prestigious Norman Bethune Medal is awarded in China as the Highest Medical Honor a doctor can earn. In 1972, Dr. Norman Bethune became a Person of National Historic Significance. After Prime Minister Trudeau (Sr) travelled to China in 1973, the birth home in Gravenhurst, Ontario was purchased. It was restored and opened its doors in 1976 as the Bethune Memorial House. In 2012, the Government of Canada erected the Visitor Centre which is run by Parks Canada as a Parks Canada Historical Site. Thousands of Chinese Visitors visit this site in Gravenhurst yearly, taking pictures with a life-size photo of Dr. Norman Bethune, which they hope will bring good luck in helping their children become doctors. In 1998, Dr. Norman Bethune was named into the Canada Medical Hall of Fame in London, Ontario. On February 7, 2006, in Malaga, Spain, they opened the Walk of Canadians to honour his medical expertise and assistance along with Canada during the Spanish Civil War. Next time you drive towards our medical clinic along Bethune Drive, you'll now remember this Gravenhurst born Medical Doctor that brought such fame to Canada and our town. Dr. Esmond himself graduated from the University of Toronto in 1994, and Dr. Stapper Buitrago also was influenced by her Grandfather Dr. Ernesto Buitrago Mantilla, who studied Medicine in France and Spain during the Spanish Civil war and met Dr. Bethune during that time. When you're in town, visit our clinic, as patients have told us they sometimes feel like they've seen the spirit of Dr. Norman Bethune wondering through the halls of Gravenhurst Medical on 141 Bay Street. Numerous Statues of Dr. Bethune were built throughout China, and one stands in front of the Gravenhurst Opera Theater. Canada Stamp showing Dr. Bethune in the operating suite. Picture taken of Dr. Norman Bethune promoting aid for the Spanish Civil War. Bethune Memorial House located in Gravenhurst, Medical, a short walk from our medical clinic. 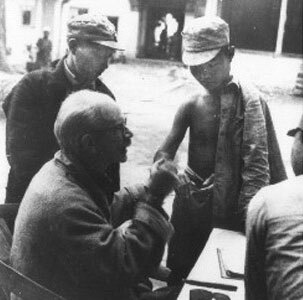 Dr. Bethune treating Chinese soldiers and villagers.